Politics are at the center of Americans’ views on many, but not all, science issues. A new Pew Research Center analysis examines U.S. public opinion on science issues, from climate change and energy to vaccines, finding that views on science issues are also influenced by education, science knowledge, and demographic factors, such as age, gender and race/ethnicity. 1 Americans are deeply divided politically on climate change and energy issues. 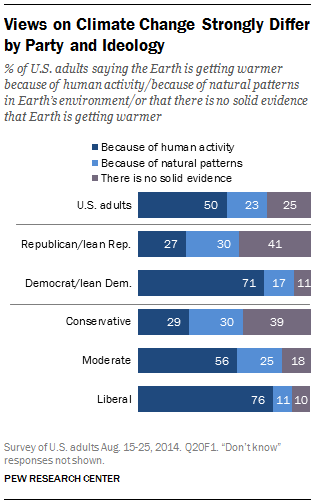 Seventy-one percent of Democrats and independents who lean to the Democratic Party say Earth is getting warmer because of human activity, compared with 27% of Republicans and independents who lean to the Republican Party. This finding is broadly consistent with other public polls and our previous research on climate change attitudes. There are also wide political differences on other important energy issues. Democrats and Democratic leaners are more likely than Republicans and Republican leaners to prioritize use of alternative energy, such as wind and solar, over traditional fossil fuel development. Further, 78% of Democrats/leaning Democrats favor stricter limits on power plant emissions to address climate change, compared with 50% of Republicans/leaning Republicans. Republicans and independents who lean to the GOP are also more likely than Democrats and Democratic-leaning independents to favor the increased use of hydraulic fracturing, or “fracking,” to extract oil and natural gas from underground rock formations; more offshore oil and gas drilling; and building more nuclear power plants. 2Politics alone does not divide Americans on science issues. Political ideology and party are either not related or weakly related to views on many biomedical, food safety and space issues. For example, a similar share (87%) of Democrats/leaning Democrats and Republicans/leaning Republicans (88%) say vaccines are generally safe for children. And liberals (41%), moderates (36%) and conservatives (37%) are about equally likely to say it is safe to eat genetically modified foods. Other science issues without major differences by political leanings include views on access to experimental drugs and views about government investment in the International Space Station. 3 There are strong generational differences on climate change, energy issues and other topics. On climate change, 31% of those ages 65 and older say the Earth is warming due to human activity, compared with 60% of those ages 18-29. 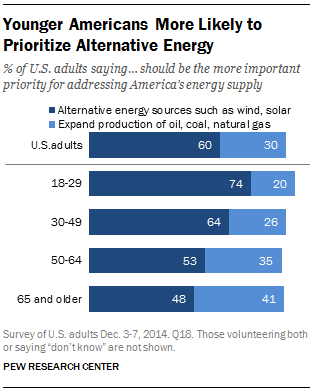 And when asked which should be a more important priority – alternative energy sources, such as wind or solar, or expanding production of oil, coal and natural gas – 48% of those 65 and older favor alternative energy, compared with 74% of those under the age of 30. 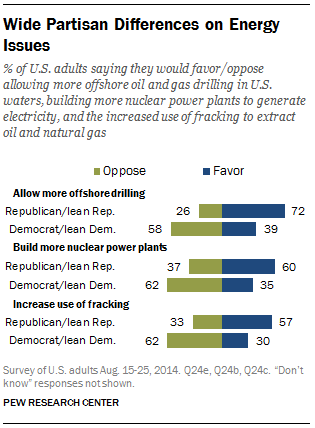 Older adults also express greater support for offshore drilling and nuclear power. There are generational differences on other science topics as well, including on childhood vaccines. 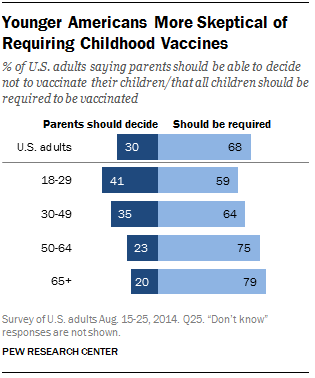 Thirty-seven percent of adults under the age 50 say parents should be able to decide not to vaccinate their children, compared with 22% of those ages 50 and older. And when it comes to the idea of changing a baby’s genetic characteristics in order to reduce the risk of serious diseases, 56% of those ages 65 and older say this would be taking medical advances too far, compared with just 42% of those ages 18-29. 4 Education is linked to views on a variety of science issues, including the safety of genetically modified foods and nuclear power. A majority (57%) of Americans with a postgraduate degree consider genetically modified foods safe to eat, while 62% of Americans with a high school degree or less say they are generally unsafe. 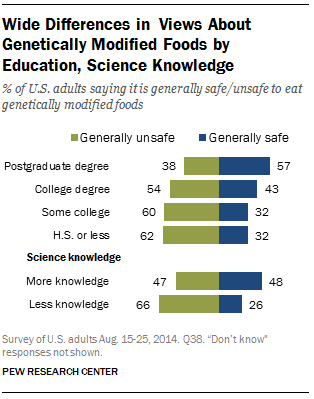 And 48% of those with more science knowledge (those who answered at least five of six science knowledge questions correctly) say genetically modified foods are safe to eat, compared with 26% of those having less science knowledge (those who answered four or fewer of six science knowledge questions correctly). On nuclear power, those holding a postgraduate degree (54%) are more likely to favor building more nuclear power plants than those with some college (43%) and those with a high school degree or less (42%). A multivariate logistic regression model predicting views on nuclear power finds education to be a strong predictor of views on this issue, even while controlling for politics and other factors. 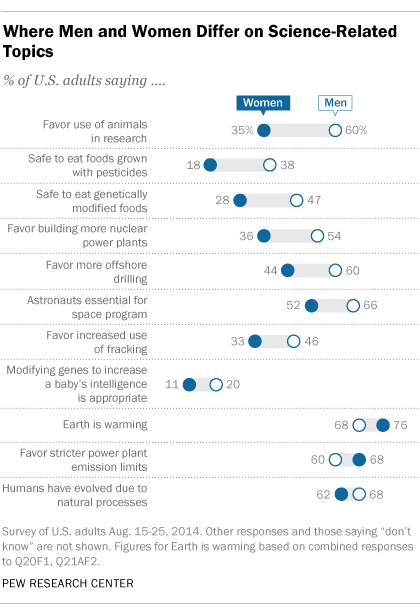 5 Men and women disagree on many science issues, most prominently the use of animals in research. Sixty percent of men favor the use of animals in research, compared with 35% of women. But the use of animals in research is not the only science issue with gender differences. Men and women differ on energy issues, with men more likely to favor building more nuclear power plants, more offshore drilling, and the increased use of fracking. And men and women also differ on food, with women less likely to say it is safe to eat genetically modified foods and foods grown with pesticides.